Seven police officers have been sprayed with ammonia, with one suffering serious injuries to his eyes, throat and lungs. 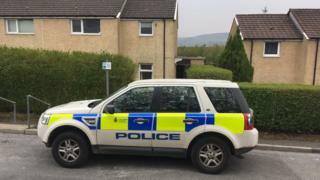 The attack happened after police forced entry to a home in Darwen, Lancashire, at about 02:00 BST following a call reporting a domestic incident. The officers were taken to hospital after they were sprayed with what is believed to be a cleaning liquid. A man escaped the home through a first floor window but was later arrested. A 46-year old man from Darwen was held on suspicion of wounding following the incident, which happened in the town's Ash Grove. Six of the officers suffered less serious injuries and were later discharged from the Royal Blackburn Hospital. Lancashire Police Chief Constable Andy Rhodes said: "My thoughts are with this officer and all of those affected by this incident, which shows once again the dangers that officers face and how they put their lives on the line."